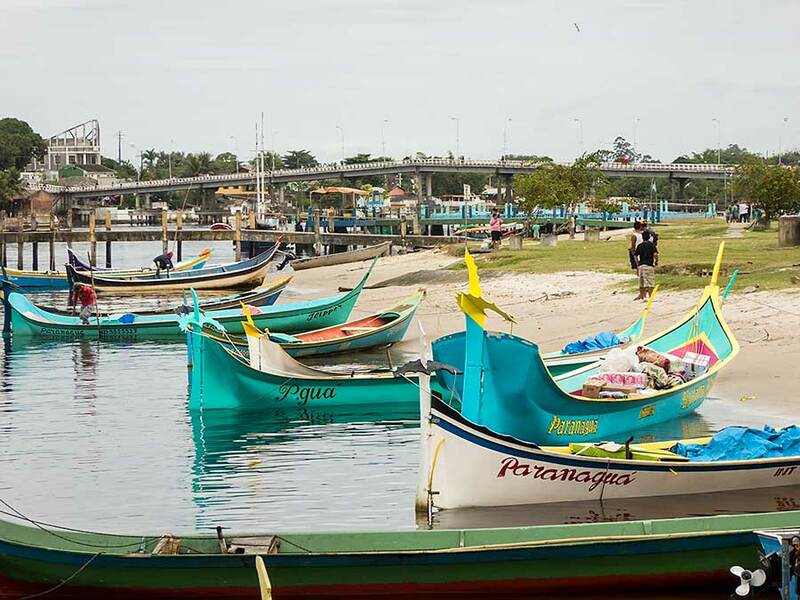 In 2013 we missed out the (relatively short) coastline of Parana, between the states of Sao Paulo and Santa Caterina. 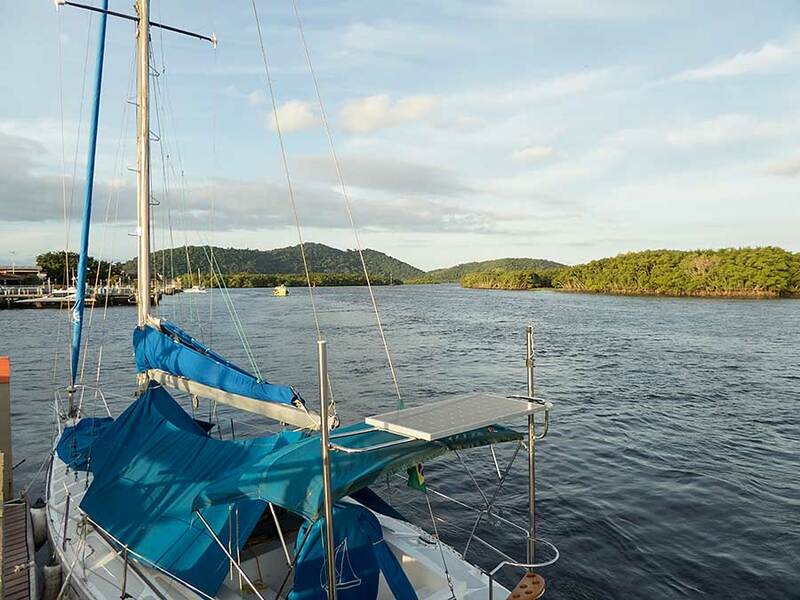 And, unless you have a shallow draft boat, Paranagua Bay is the only real option. 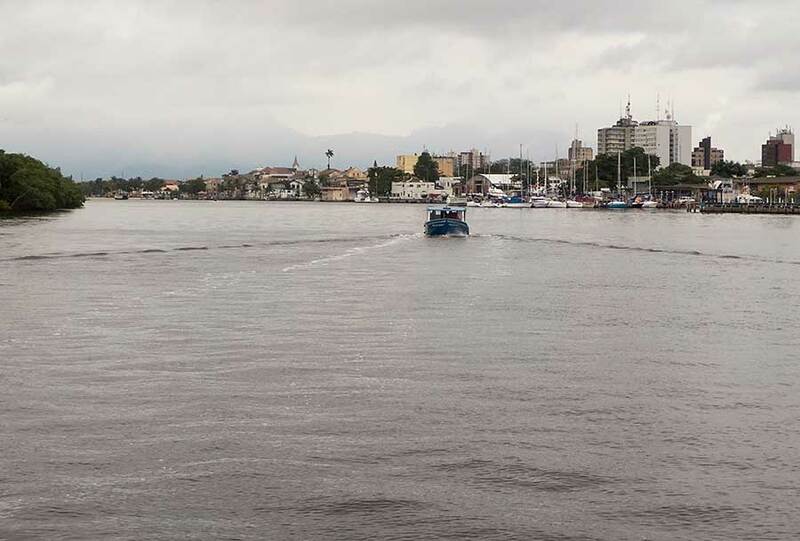 The state of Parana is most famous for the Iguazu falls, at the other side of the country, but Paranagua Bay is also famous in Brazil for the Ilha do Mel, which we passed when entering. As usual after a sea passage, we were happy to rest for a while, and all was quiet on Ilha Cotinga. The Yacht Club water taxi came and went but - apart from a friendly wave - no one took any notice of us. In the afternoon we went ashore and spoke to the caretaker, discovering that we were just in time to catch the next water taxi trip to the river Itibere and the main Yacht Club premises. The Yacht Club offered us a berth on one of their pontoons so we took the opportunity to be close to the town. Also, we found that the moorings at the Annex are not very comfortable, being exposed to southerly winds and subject to strong tidal flows. The next day we motored to the Yacht Club pontoon, with the water taxi to guide us. Getting into our berth stern-to was quite a challenge, even with the help of Yacht Club staff, but once in we were comfortably secure. The tidal flows and disturbance from passing traffic were not too bothersome. The main port operations are on the other side of the town but the river Itibere is busy with both tripper boats and small local craft - including some rather delicate-looking craft, narrow with high ends and an unusual tiller arrangement. 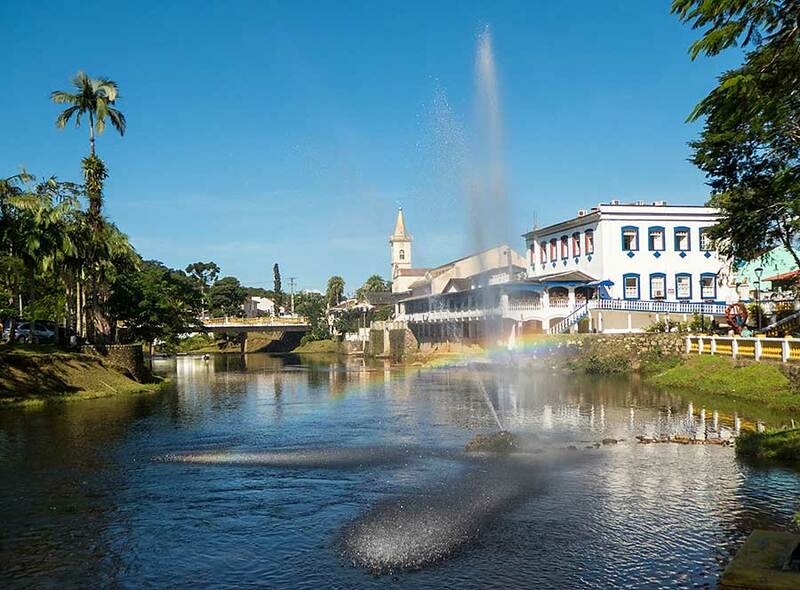 Despite the major port operations the environment around Paranagua is very beautiful, with the backdrop of the imposing Serra da Graciosa mountains, the low key holiday hotspot of Ilha do Mel and many remote islands, including the Supergui national park, home to rare rainforest flora and fauna. Weather permitting we hoped to venture inland a bit as well as spend a night or two in one of the remote anchoring spots. Perhaps we would see a black-faced lion tamarin, unique to this area and only discovered in 1990? Having settled in we first spent a day exploring the old town of Paranagua, which has many colonial buildings in varying states of decay. Quite a few have now been restored and both the cobbled back streets and riverfront promenade are very pleasant even in the rain. The major tourist pull in the area is the Ilha do Mel but the town promotes itself well, with helpful tourist information signs everywhere. A big disappointment though, is the railway station. It's a magnificent building but is no longer in use and was in the process of being boarded up when we passed by. 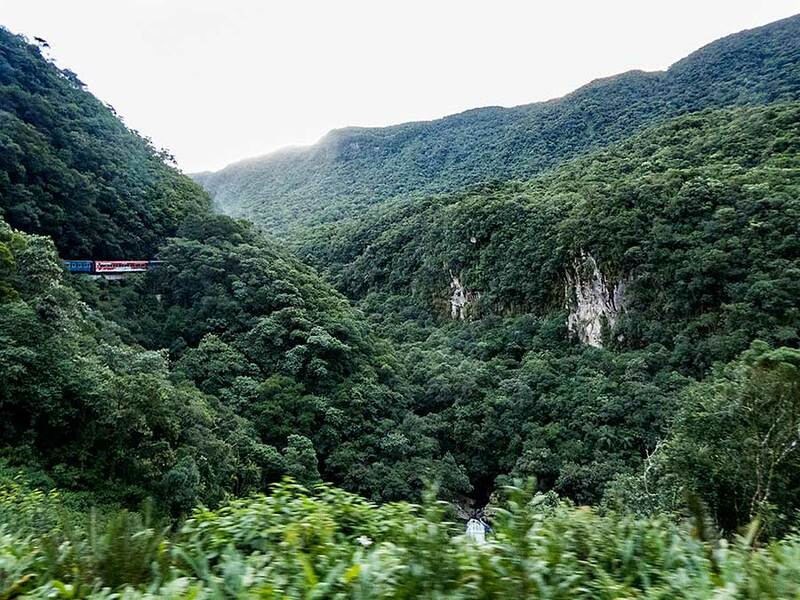 The famous Serra do Mar train which used to link Paranagua to the state capital Curitiba, wending it's way up through the steep Serra da Graciosa mountains, no longer reaches here. To add to our enjoyment of Paranagua, we found a very good fish restaurant, overlooking the riverfront. Once again we were able to enjoy the lovely fresh seafood found along this coast - our favourite being prawns, simply cooked in oil and garlic - washed down with Vino Verde (imported from Portugal). When the forecast was good for a couple of days we packed our toothbrushes and insect repellant and headed inland. We got to the bus station mid-morning to catch a bus to Morretes, described to us as a "sleepy little place" by a local acquaintance. There was a long queue to get on the bus and we stood almost the whole way. The sleepy little town was heaving with visitors and the streets were crammed with market stalls. They were having a fiesta, partly selling handicrafts but also displaying horticultural produce from the region. It was hard to imagine what the town was really like. We had been told to try the local speciality, Barreado, for lunch and went to the recommended restaurant. It was very busy and operating more like a canteen, serving up the local dish at a slick pace. Barreado is stewed beef and there's a knack to eating it - demonstrated to us by the head waiter. The meat is sprinkled with a generous helping of manioc flour and mixed up into a mush, then eaten with rice and slices of banana. It's doesn't look particularly attractive but tastes quite good. For some reason the meat on it's own is hard to digest and the manioc flour makes it more palatable. By this time we had twigged that being May 1st it must be a holiday in Brazil. After lunch we strolled around the streets - admiring some of the fruit and vegetables on display, not all of which we could identify. 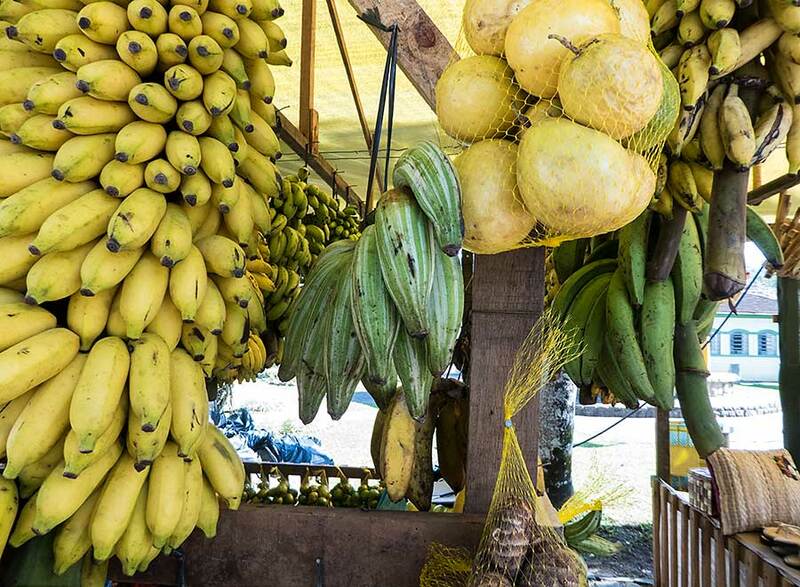 Perhaps the most interesting was a stall with many different types of bananas grown locally, including green stripey ones. Soon it was time to move on to the train station. Morretes is the start of the daily passenger service to Curitiba. From here the train climbs slowly up through the forested mountains for an hour and then winds its way around the mountain for another hour with spectacular views, going over numerous viaducts and through 13 tunnels. 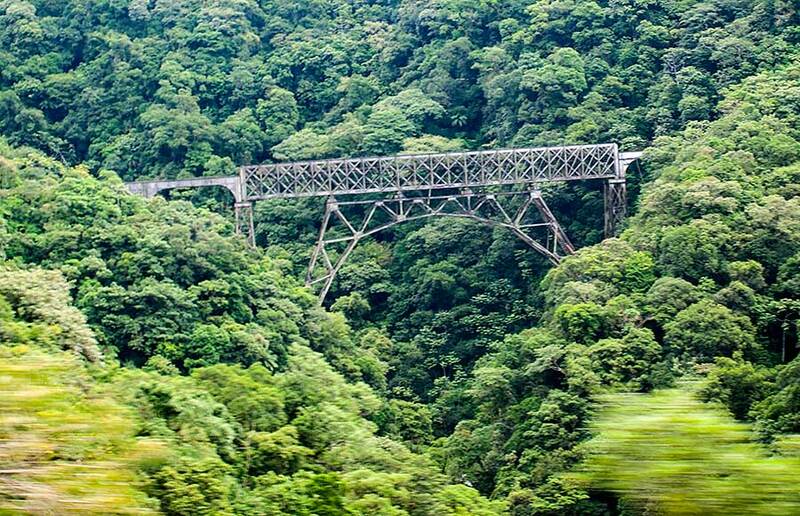 On a clear day it is a very scenic ride and one can but marvel at the work involved in building such a railway. At various points we saw hikers - no doubt that's the best way to enjoy the views. 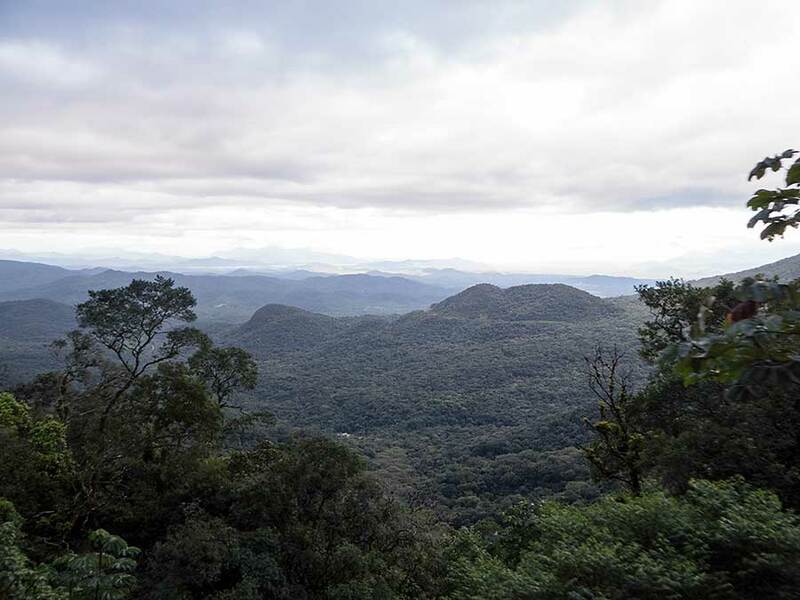 The long, slow meander into Curitiba - another hour and three-quarters - was less interesting, though much of the countryside was attractive, dotted with aracauria pine trees. Occasionally we would pass goods trains on their way to Paranagua port: trains that presumably keep the railway viable. Must have been fun to build - but first: much work with the machete! 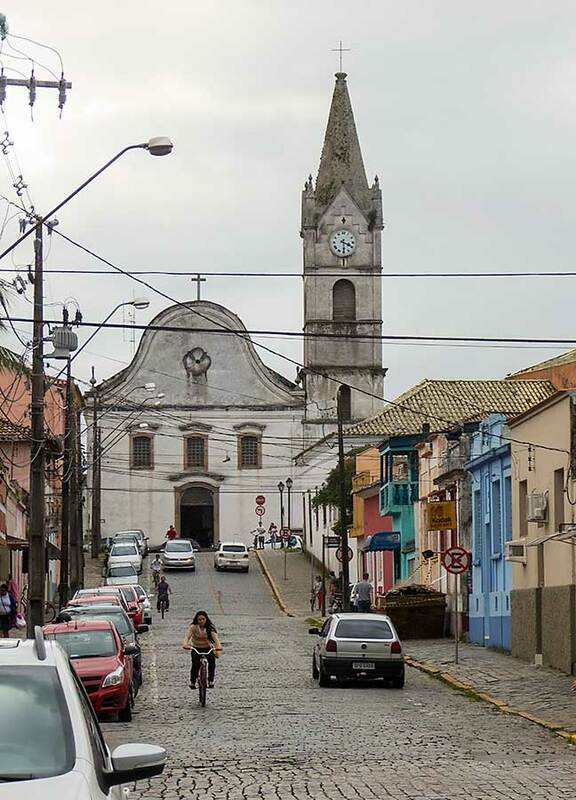 Our guide book describes Curitiba as a Brazilian Milton Keynes. We found it hard to see any likeness. We stayed in a lovely hotel, in a refurbished old building, near the centre. In the morning we went to the main square hoping to catch the tourist bus to see the sights, but being Saturday the queue was very long so we contented ourselves with a walk around the historic parts of the centre. 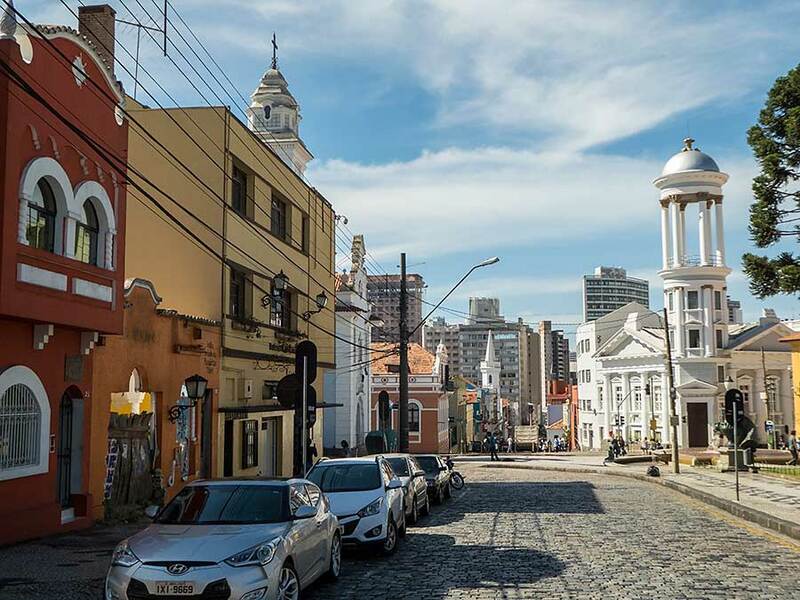 On a sunny morning (and indeed on any other sort of morning) there are numerous cobbled streets with brightly painted colonial buildings to amble through and admire, and plenty of leafy squares in which to linger. 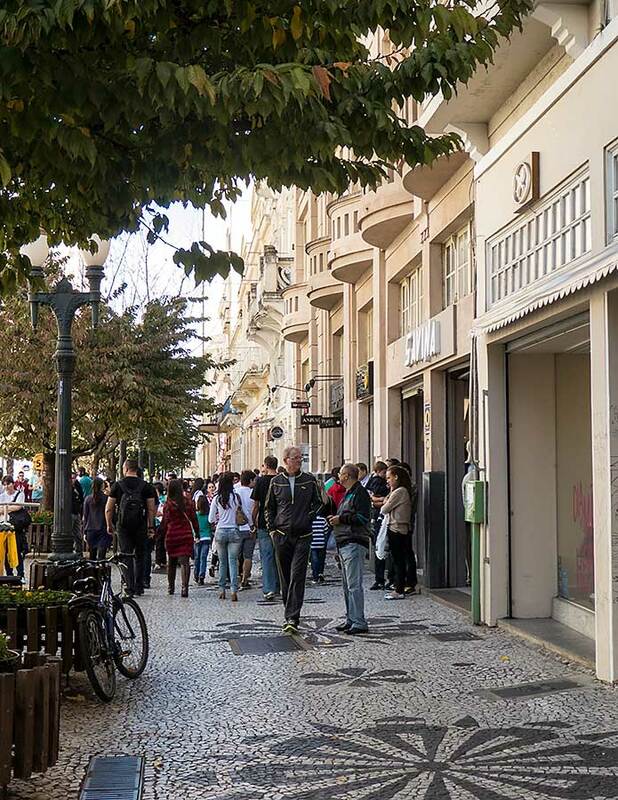 The main shopping street - 15 de Novembro - is pedestrianised and a good place to get the feel of the city and its people. 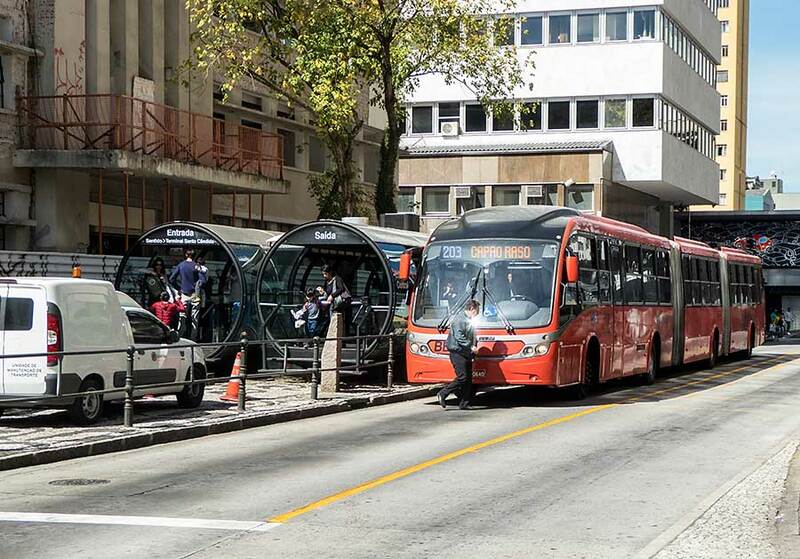 Curitiba is renowned for it's well organised transport system and we were very impressed by the double bendy buses and black pod-like bus stops. Double-bendy buses serve fast routes with futuristic bus stop pods. A few hours there was enough and we caught the afternoon bus back to Paranagua - a comfortable hour and forty minutes journey along the main road. Winding our way back down through the mountains the views are again spectacular - perhaps as good as on the train - and it would have been nice to stop along the way. Walking back to the boat along the waterfront at Paranagua it felt as if we'd been away for much longer. On Sunday the weather became cloudy and drizzly again. We seem to have only 2 days fine weather per week at the moment. If we were to spend a day or two exploring the Ilha do Mel we might have to wait another 5 days for clear enough weather to make it worthwhile. In the meantime we had southerlies forecast - just what we needed for continuing north - so we left on Monday afternoon, on the ebb tide. By the time we got to the bar at the entrance to Paranagua bay it was dark and the southerly wind against the ebbing tide made for rough and sometimes breaking seas. The motion when crossing Paranagua bar is very much like at Salcombe bar, but the bouncy bit lasts for four or five miles! We also had 3 big ships to contend with so we had an anxious hour negotiating the long narrow channel on our way out to sea. In such situations the AIS is a great help in identifying where the ships are and their movements. Once at sea we had a small hiccough when the Aries vane came free and rose to the surface. We had to heave-to and tighten it down again. (Paul is now working on a fix to make it easier to tighten.) After that little drama we made good progress, sailing north-east on a reach. Initially we passed the longest stretch of remaining undeveloped Atlantic rainforest and then, in complete contrast, we were approaching the biggest port in Brazil, Santos. As we passed Santos the wind lessened and we had to beat the final stretch, arriving at Ilha Montao de Trigo just after dawn on Wednesday - 202 miles sailed in 38 hours. On the way we also passed two interesting islands. One is Queimada Grande (Great Burnt Island) which is infested with snakes - and not just any old snake. Apparently they are a unique species of the pit viper and highly poisonous. We didn't stop to find out more. The other interesting island is Alcatrazes, which apparently has very clear water and superb diving - that is if you're interested in finding unexploded shells left by the Navy who used to use the island for target practice much to the consternation of environmentalists. The reason for stopping at Ilha Montao de Trigo is that we are anchored next to Silvio's boat, Matajusi. We met Silvio in 2013 and stayed at his flat in Sao Paulo so we're looking forward to meeting him again.